The 3 Trillion-Gallon Leak — Where's Our Water? The tipping point is here, and utilities are learning the best ways to prevent water loss and protect revenue. May you live in interesting times. Though widely purported to be Chinese, this phrase is of unknown origin. It is an ironic expression — intended as a curse rather than a blessing. Uninteresting times mean peace and tranquility. In today’s world of water — like it or not — we live in interesting times. Access to enough safe water is a serious issue around the world, though we have historically been fortunate in this regard in North America. If we needed more water, we just added another supply line. Those days are largely gone, as the costs to develop the supply have gone up, and the availability of the supply has gone away. How we manage this precious resource is more important today than at any other point in history. All of this points to the convergence of environmental, political, technological, and regulatory drivers for an explosion of adoption across North America for advanced water loss management practices. We are on the cusp of significant advancements in 1) the widespread adoption of established management practices, and 2) innovation in water loss technologies and management practices. 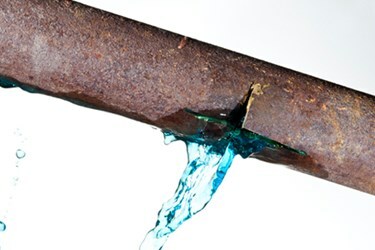 Every pipe network leaks. Every metering system misses water. Every billing system has quirks. And every water system experiences theft. These are the components of water loss, and every system has them — all of them. Each of these water loss components exerts a tangible, measurable cost on the utility. These costs are often masked. Chemical and power costs were up last year? Perhaps due to more leakage that you treated and pumped. Revenues not keeping up with expenses? Perhaps a decline in meter performance. The truth is that water loss is an embedded cost, so it’s easy to pretend that it’s not there. And the reality is that unmanaged water loss is the most expensive kind there is. One-hundred-percent of water systems have a water loss program. When leaks show up, we fix them. When meters stop, we replace them. When we see people stealing water, we fine them. But few systems have a proactive water loss program, seeking out these issues before they happen, based on a sound business case for action. If we wait for issues to find us, we are overspending. It may not feel like it — because the cost of no action is embedded — but it is there. And just as every system has water loss, every system has an economically optimum level of water loss. Reactive programs will not get us to this economic optimum. The gap between our water loss today and our economic optimum represents our business case for action — and the business case against no action. The tipping point brings a mainstream awareness of these issues and pushes the methods and tools forward for solving our hidden problems. Sectorization of pipe networks into leakage management zones, commonly known as district metered areas (DMAs), is certainly an established practice around the world. There are some utilities in the U.S. that have been employing this practice for many years. On the whole, however, DMAs are not an established practice in the U.S. But this is changing. Utilities without DMAs are leveraging existing pressure zone configurations as a foray into leakage management zones.7 And utilities with DMAs are pushing the boundaries of technology to achieve one-man step testing and pushing the boundaries of the technical minimum leakage levels.8 DMAs represent a tool in the toolbox for leakage management. Like acoustic leak surveys, DMAs fall under “active leakage control” — proactively localizing, pinpointing, and repairing leaks before they find you. 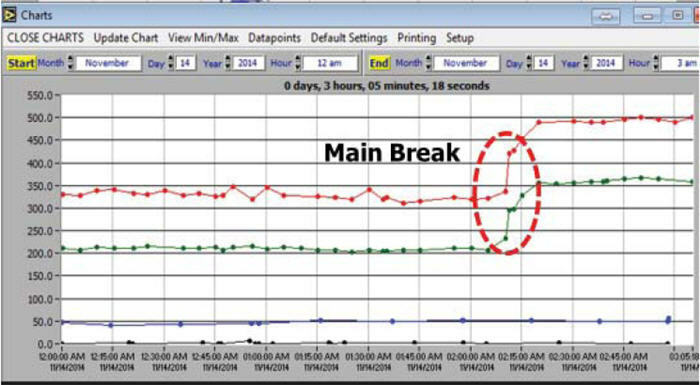 Another underutilized tool in the leakage toolbox that is beginning to take hold in the U.S. is pressure optimization. Traditionally, our pipe networks have been designed with full consideration for the occurrence of minimum pressures but little or no consideration for the occurrence of maximum pressures. The relationship between lower pressures and lower leakage rates has been well understood for nearly two decades. More recently, the relationship between lower pressure and fewer breaks has become well understood. Beyond these very tangible benefits, the impacts of pressure on energy costs and pipe replacement costs are now coming into full view. Just as with the car we drive, how we operate our water networks has a direct impact on operating costs and the effective life of the pipes. It turns out that these impacts, when aggregated, can be tremendous. Utilities and even state agencies9 are beginning to recognize the potential in these advanced optimization practices. On the revenue side, some interesting case studies are emerging where utilities are moving to optimize revenue losses on their large customer meter populations. Conventional wisdom10 suggests a large meter testing should be dictated by meter size. Utilities are beginning to employ a benefit-cost approach11 to these programs, looking at the probable gain based on consumptive revenue and how this stacks up against testing and remediation costs. What they are seeing from this is a meter-specific testing plan that identifies which of their nonresidential meters are economically justified for testing very often and which should not be tested at all. And the results are compelling. What will 2016 bring? Web traffic statistics tracked by AWWA12 support what we are generally observing in the media and at conference events: The issue of water loss is mainstreaming. With this comes a broader adoption of entry-level practices — standard AWWA water auditing. But it also brings the continued adoption and innovation of advanced practices for leakage and revenue management that propel the industry forward. 1. Senate Bill 555, signed October 9th, 2015. 4. Wisconsin Water Association & Public Services Commission – Pilot Water Loss Training – Sept 2015 – Feb 2016. 5. Oklahoma DEQ – Pilot Water Audit Program Presentation. Proceedings from ASDWA Annual Conference 2015, Fort Worth, TX. 7. City of Asheville, NC – Case Study Presentation. Proceedings from AWWA Water Infrastructure Conference 2014, Atlanta, GA.
8. Water & Wastewater Authority of Wilson County – Case Study Presentation. Proceedings from AWWA Annual Conference 2015, Anaheim, CA. 10. AWWA M6 Manual – Water Meters-Selection, Installation, Testing & Maintenance. 11. New York City DEP and Asheville, NC – Large Meter Economic Optimization Program. Proceedings from the North American Water Loss 2015, Atlanta, GA.
12. Minutes from AWWA Water Loss Control Committee meeting, October 2015, Bethesda, MD. Will Jernigan, PE, is a director with Cavanaugh and a nationally recognized leader in water loss management and bioenergy. Will has 15 years in the industry, and is active with AWWA in several ways, including vice chair of the AWWA Water Loss Control Committee, principle author on the M36 Manual for Water Loss Control, 4th Edition, chair of the inaugural North American Water Loss Conference (December 2015 in Atlanta), and member of the IWA Water Loss Specialist Group.